After listening to your feedback, we're moving Tiki Kon to a new location right in the heart of Portland and located on three light rail lines—just steps from the nearest stop. Nearby you'll find restaurants, groceries, coffee, shopping, liquor, movie theaters, and more. We'll miss the early 1970s charm of our previous location, but we're really looking forward to treating you to upgraded service and comfort. 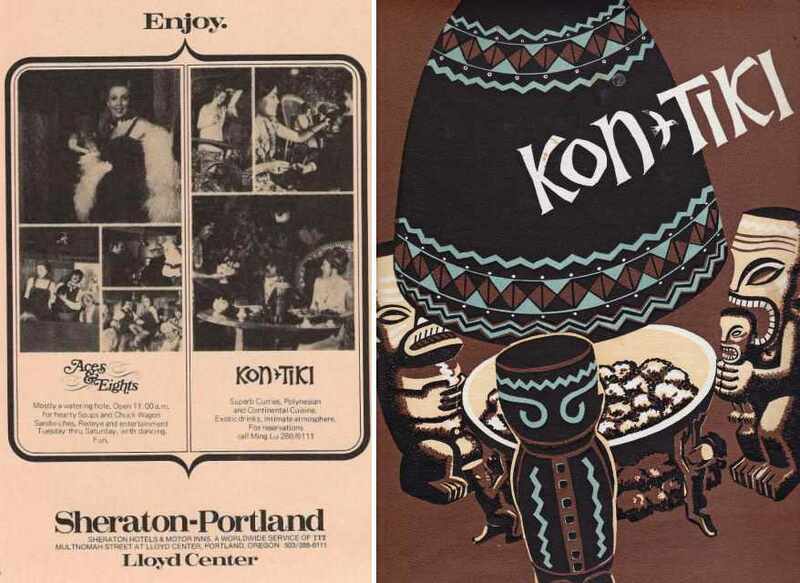 Previously the Sheraton-Portland, the DoubleTree was once the home to our namesake, Steve Crane's Kon-Tiki Portland restaurant, which closed in 1981. We will be paying homage to the old spot at Tiki Kon this year, and you can find tikis and other artifacts in their new home at Hale Pele! Learn more about the Kon-Tiki at Critiki. A vintage ad and menu cover from the extinct Kon Tiki restaurant, once located on the grounds of the Doubletree.